Paper cups at coffee shops are designed for on-the-go convenience. You pick them up, take them with you and then dispose of them at your convenience later. Most are trashed, not recycled. Using a reusable cup – either ceramic or plastic – is the solution for many consumers concerned about waste but wanting to keep the convenience of to-go cups. 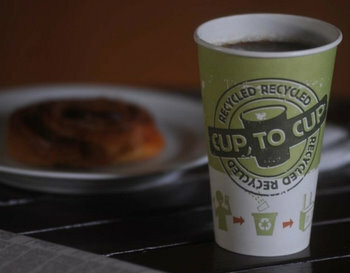 International Paper has tested the viability of another option: cup-to-cup recycling. This is a process that transforms previously used paper coffee cups into new, complete food safe cups with no new paper waste. It’s a great idea, but there is one big caveat and that is that consumers have to participate by recycling their cups in the first place. To make this plan really workable, a large volume of coffee cups would have to make it into the paper plants to be pulped, treated (not all recycled paper products need to be made completely food safe, so there is some additional processing) and reformed into new cups. A continued push for consumers to use reusable cups is probably the best option for now, but it’s interesting to see what might lie in the future for coffee cups, and what new processes are being developed to satisfy the seemingly growing desire of consumers to reduce their eco-footprints.